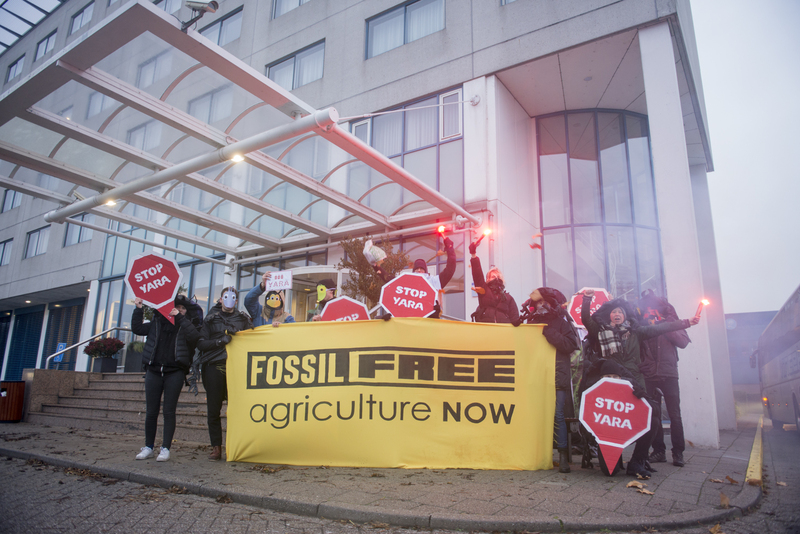 Wednesday morning, November 28th, activists from the Fossil Free Agriculture campaign protested in front of the European Mineral Fertilizer Summit against the use of synthetic fertilizers and the influence of fertilizer companies on climate policies. 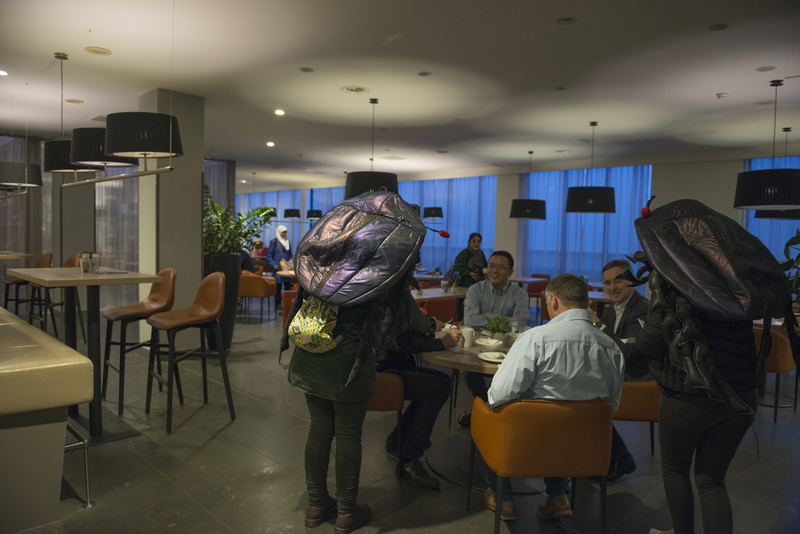 This summit, which took place in a hotel in Badhoevendorp, had employees of fertilizer giant Yara and the lobby organisation Fertilizers Europe on the speakers list. A ticket to get in was 1600 Euros. ASEED requested to attend the summit as this is our area of work as well, and never received a response from the organizers. 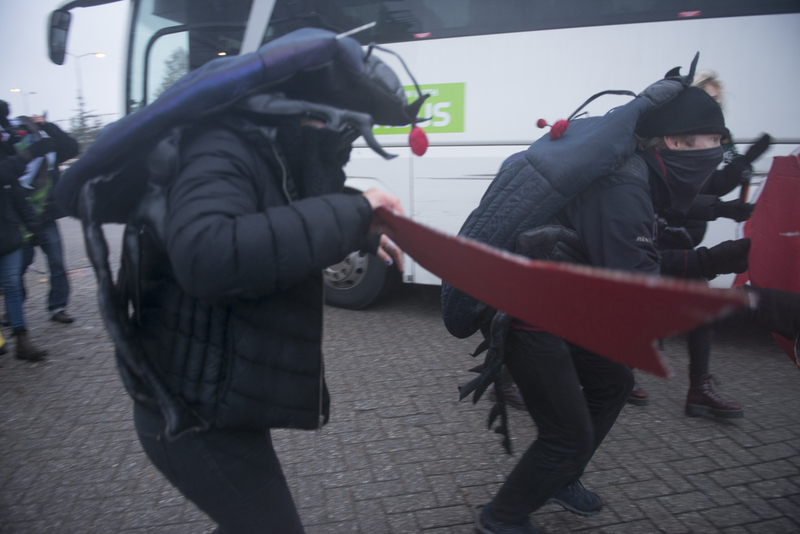 Since we could not enter the talks we came dressed up as bugs and plants at the entrance to explain to the participants that the combination of Yara and sustainable agriculture is exactly like Shell and a sustainable, just energy transition. Synthetic fertilizer producers and proponents of industrial agriculture argue that by 2050 we will have ten billion mouths to feed, requiring more land to grow more crops. They say that synthetic fertilizers are vital for this process. But this is not fact, this is greenwashing – a strategy by multinational corporations who wish to promote themselves as having the solutions to feeding the world in ways that protect the environment. But who in reality are destroying the climate and soil through a system that relies heavily on fossil fuels. The Global Alliance for Climate Smart Agriculture is a perfect example of the greenwashing industry lobby. 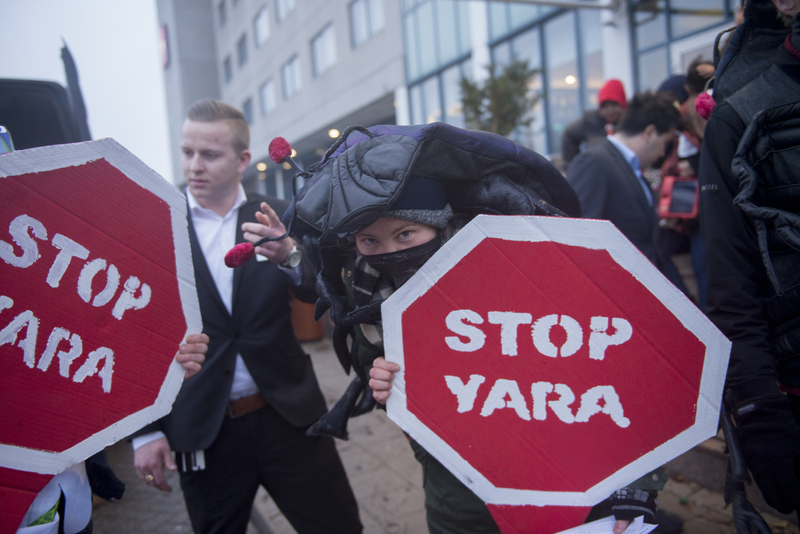 Used by organisations such as Yara International and Fertilizers Europe GACSA lobbies for “solutions” that serve multinational interests and expands their control of markets. Plants need fertilization, but this can be found in organic forms without contributing to mass climate change. 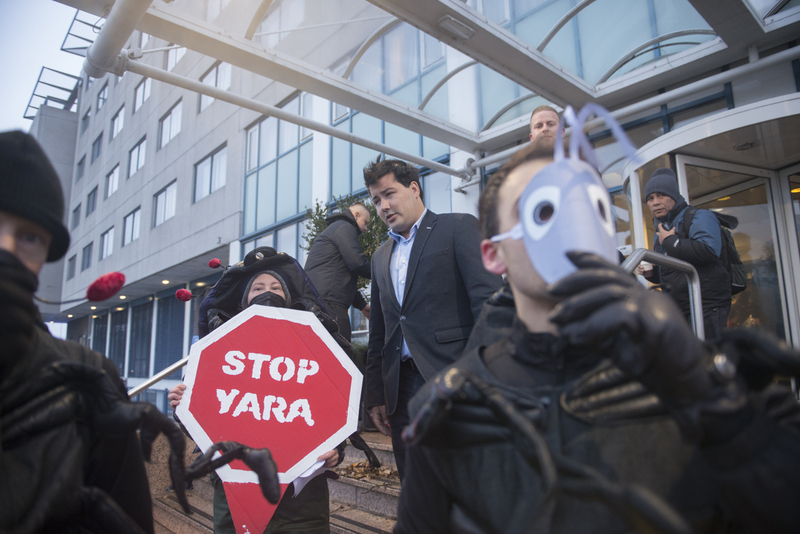 Synthetic nitrogen fertilizer requires large quantities of fossil gas for their production, – a reason why Yara supports the reckless gas extraction happening in Groningen, North Netherlands, which is the cause of hundreds of earthquakes, and are a major contributor to greenhouse gas emissions. Once applied, more and more synthetic fertilizer is required to ensure similar yields. This addiction to synthetic fertilizers is exactly what companies like Yara need, as it equates to more and more profit for them – and greater dependence from farmers. Companies such as Yara like to talk about how they are working on new technologies for precision fertilization. They want us to see this as them making small steps to reduce soil degradation, water pollution and emissions of greenhouse gasses. However, these techno-fixes serve to perpetuate an industrial agriculture system that is devastating for the planet. Agro forestry, use of perennials and mixed cropping all increase soil resilience and decrease the need for external inputs. Green Manure – planting rye corn, vetch, clover. This method binds nitrogen from the air and builds up soil from within itself. Compost – Created from the decomposition of carbonaceous organic material such as straw, leaves and mixed with nitrogenous material such as crop residues builds up organic matter, which is essential for maintaining soil fertility. Soils improved in these ways make the land and agriculture more resilient against droughts and increases biodiversity – a dire necessity in times of climate chaos and mass extinction. However, these alternative practices don’t make profits for multinational companies. Hence their desperate need for marketing propaganda that ensures they are seen as indispensable for feeding the world. These sustainable practices can definitely be improved! For this reason it is necessary that research money is redirected from industrial farming towards these alternative techniques. The current agricultural system is responsible for around half of the global greenhouse gas emissions. This week, once again, there was negative news about climate change and failing policies. “Compared to current policies the original level of ambition needs to be roughly tripled for the 2°C scenario and increased around fivefold for the 1.5°C scenario,” states the Emission Gap report presented by UN yesterday. Meanwhile the Dutch klimaatberaad is frustrated by the subgroup of main polluters. 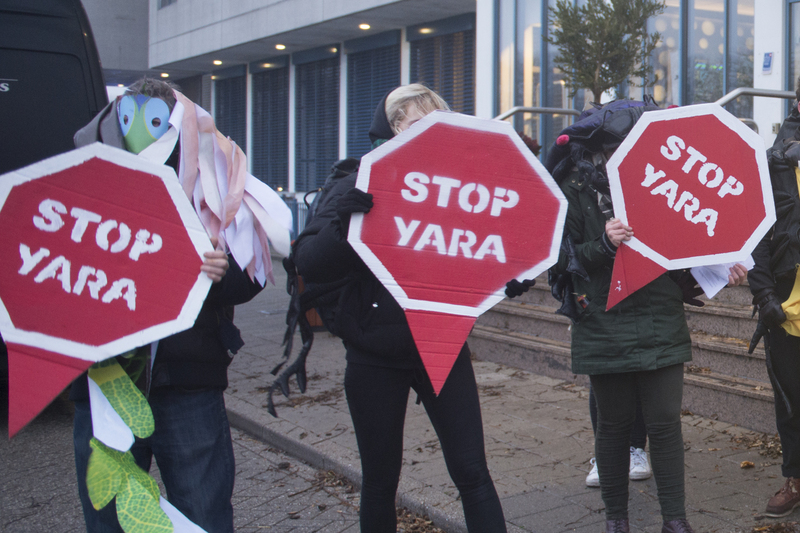 Yara, number 7 on the list of Dutch greenhouse gas emitters, is in this powerful group, together with oil companies and large chemical corporations. Immediate action is necessary! This time we stood friendly and playful in front of the congress. 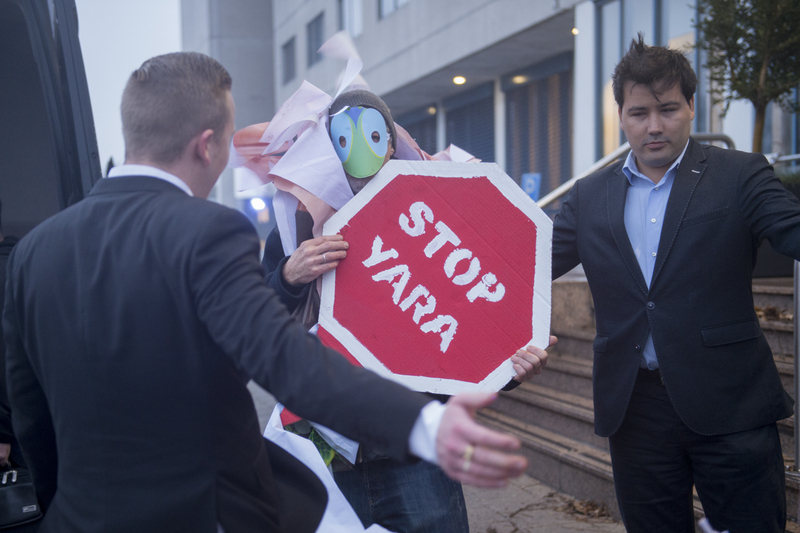 But the Fossil Free Agriculture campaign, together with the international campaign Free the Soil, will not stop fighting against Yara any time soon. The bugs will be back, next time with more comrades of healthy soil. We believe in a complete system change to agro-ecology, food sovereignty and local organic farming. Watch the short video of the action.